It is not as bad as it looks. The weak jobs report at the beginning of June sparked a sudden bearish slant to the outlook, causing recession fears to bubble up once again in the past few weeks. Big-time investors from George Soros to Bill Gross sounded off about the impending doom of the economy. Strategists across the research plains started pointing out worrying trends. Heck, even we started to point out some worries. Enter a voice of sober restraint (or unbridled bullishness, depending on your own priors), in the form of Deutsche Bank economists Peter Hooper, Michael Spencer, Torsten Sløk, and Matthew Luzzetti. The quartet of economists believe that there are certainly trends that you can point to if you want to argue for an imminent recession, but everyone is getting a bit ahead of themselves. The most recent argument for recession seems to have a common theme — corporate behaviour. Either due to the build-up of debt and the costs associated with servicing it or increasing labour costs, analysts have argued that this is putting pressure on corporate profits. Following a decline in profits, companies will be worried about maintaining their business so they will cut back on expenses. This can hurt the economy because companies stop investing in the growth of their own companies. On the other side are Hooper, Spencer, Sløk, and Luzzetti, they wrote that sure, profits are down, but in context of long-run averages that’s not as bad as it appears. 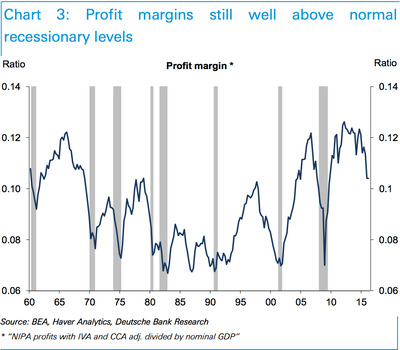 “Aggregate US profits and profit margins have been declining over the past year and a half, but from historically high levels, and they remain well above previous average levels,” wrote the economists. 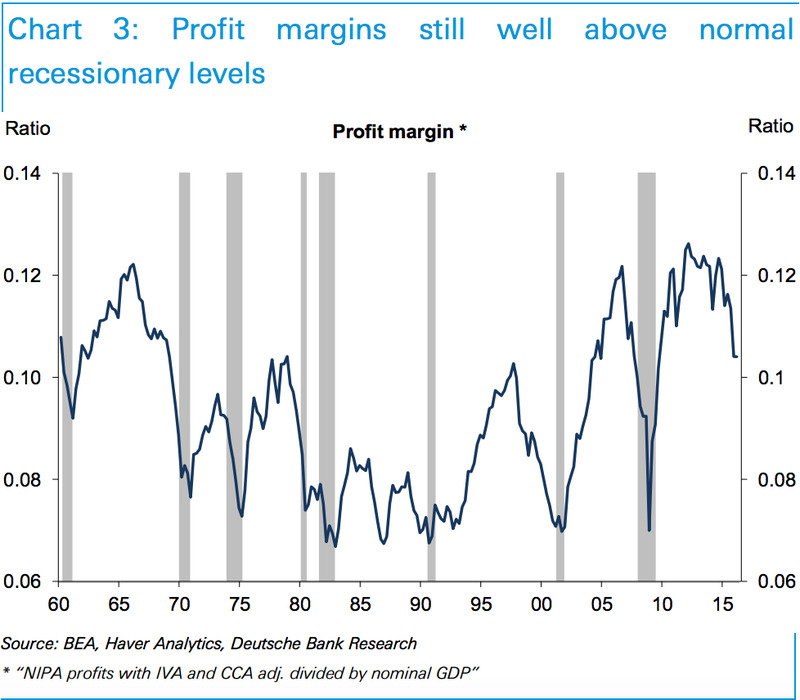 They also noted that national income and product account (NIPA) margins, which encapsulate a wider swath of the economy than the S&P 500, only just began to slide and they usually peak in the middle of business cycles anyway. They also argues that the drop-off in margins and profits has been exacerbated by the strong dollar and lower oil, and these transitory factors are dragging the measures down. Then, when the bears see them hit these levels, they can call for a recession without evaluating the full context of the decline. Additionally, the impetus for the recession calls — the jobs report — may just be a reaction to past growth fears that are fading. In standard labour demand equations, past movements in real GDP growth (with a one-quarter lag) tend to do slightly better than current movements in explaining changes in employment growth. When output growth in Q1 turned out significantly weaker than initially expected, firms may have revised down their expectations for future growth and adjusted down their hiring accordingly for Q2. Now that growth appears to be picking up again, we may be able to look forward to some recovery from the recent softness in payrolls. Recessions, as the economists argue it, are really caused not by one or two factors, but by excesses. Excesses in monetary policy, financial assets, or surprise. In their view, no such excesses exist. “US recessions are generally caused by one or more of three factors: policy tightening in response to an overheating economy, investment imbalances that lead to a credit crunch/financial collapse, and external shocks,” said the note. External shocks: Oddities are hard to predict and can come out of nowhere, so it is hard to estimate if this could be a cause. The most likely external shocks of oil, China, or Brexit causing a US recession, are overblown according to the Deutsche team. To be fair, though, the whole point of a “black swan” is you never see it coming. Based on most models recession is still a slim possibility over the next 12 months. The New York Fed’s model based on the yield curve gives it a 6.6% change of happening, Deutsche Bank’s high frequency indicator sits at 5.7%, and a GDP-based model is also relatively low. Add all that up, and it seems that the fears of a recession may be little more than that, fears. “Of the various factors that normally lead to recessions in the US, none is especially pressing now,” concluded the team of Hooper, Spencer, Sløk, and Luzzetti, though they admitted there are some limitations. “We acknowledge that these models, and indeed the economic profession does not have an especially good record in predicting recessions a year or two out,” the said.